Nevertheless, the designation ALO does address the main feature of the condition—namely, the inability to open the eyes at will with preservation of the ability to open them and keep them open at other times. [3, 4, 5, 6, 7] ALO may present either in isolation or in association with blepharospasm. [8, 9, 10] The challenge for management lies in differentiating these 2 entities. Although the underlying mechanisms of ALO have not been clearly elucidated, it is believed that this condition may involve an abnormality in the supranuclear control of voluntary eyelid elevation, which requires the activation of the levator palpebrae superioris (LPS) and the concurrent inhibition of orbicularis oculi (OO) activity. 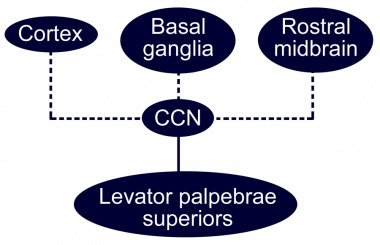 Diagram of the possible central pathways involved in the generation of inhibitory responses of the levator palpebrae superioris muscle. Caudal central nucleus (CCN), central caudal subdivision of the oculomotor (III) nucleus. Disturbances in burst, tonic, or pause neurons within any of the aforementioned premotor structures may result in abnormal inhibitor inputs to the LPS motoneurons. Some patients may experience an associated disruption in reciprocal activation of the LPS and the OO. Apraxia of lid opening (ALO) has been reported in 7%,  10%,  and 55%  of patients with blepharospasm. Benign essential blepharospasm has a prevalence of 12 per million in Japan,  17 per million in Rochester, MN, in the United States,  30 per million in northern England,  and 36 per million in the Epidemiologic Study of Dystonia in Europe. The wide variation in these figures may reflect sample bias. The peak age of onset is in the sixth and seventh decades of life. ALO appears to be more common in women than in men. In a report describing 10 new individuals with ALO and reviewing 11 cases previously mentioned in the literature, Defazio et al found a female-to-male preponderance of 2:1. No racial differences have been reported. ALO does not directly cause mortality. The morbidity noted in patients with this condition is mostly related to the underlying disease and to the visual impairment in individuals with severe eye closure. In patients with isolated ALO, the prognosis is excellent. In ALO patients who have other underlying diseases, morbidity or mortality may result as a consequence of the associated condition. Goldstein JE, Cogan DG. Apraxia of Lid Opening. Arch Ophthalmol. 1965 Feb. 73:155-9. [Medline]. Geschwind N. The apraxias: neural mechanisms of disorders of learned movement. Am Sci. 1975 Mar-Apr. 63(2):188-95. [Medline]. Boghen D. Apraxia of lid opening: a review. Neurology. 1997 Jun. 48(6):1491-4. [Medline]. Rucker JC. Normal and abnormal lid function. Handb Clin Neurol. 2011. 102:403-24. [Medline]. Suzuki Y, Kiyosawa M, Mochizuki M, Ishiwata K, Ishii K. The pre-supplementary and primary motor areas generate rhythm for voluntary eye opening and closing movements. Tohoku J Exp Med. 2010. 222(2):97-104. [Medline]. Langevin JP, Srikandarajah N, Krahl SE, Gorgulho A, Behnke E, Malkasian D, et al. Eyelid apraxia associated with deep brain stimulation of the periaqueductal gray area. J Clin Neurosci. 2014 Sep. 21(9):1652-3. [Medline]. Jordan DR, Anderson RL, Digre KB. Apraxia of lid opening in blepharospasm. Ophthalmic Surg. 1990 May. 21(5):331-4. [Medline]. Krack P, Marion MH. "Apraxia of lid opening," a focal eyelid dystonia: clinical study of 32 patients. Mov Disord. 1994 Nov. 9(6):610-5. [Medline]. Hsieh CY, Sung PS, Hwang WJ. Transient blepharospasm, apraxia of eyelid opening, and hemidyskinesia following a right parietotemporal infarct. Parkinsonism Relat Disord. 2014 Sep. 20(9):1024-6. [Medline]. Aramideh M, Bour LJ, Koelman JH, Speelman JD, Ongerboer de Visser BW. Abnormal eye movements in blepharospasm and involuntary levator palpebrae inhibition. Clinical and pathophysiological considerations. Brain. 1994 Dec. 117 (Pt 6):1457-74. [Medline]. Esteban A, Gimenez-Roldan S. Involuntary closure of eyelids in parkinsonism. Electrophysiological evidence for prolonged inhibition of the levator palpebrae muscles. J Neurol Sci. 1988 Jul. 85(3):333-45. [Medline]. Esteban A, Gimenez-Roldan S. [Nociceptive reflex of the orbicularis oculi. Study in normal subjects and in peripheral facial lesions]. Arch Neurobiol (Madr). 1973 Jul-Aug. 36(4):283-94. [Medline]. Elston JS. A new variant of blepharospasm. J Neurol Neurosurg Psychiatry. 1992 May. 55(5):369-71. [Medline]. Lepore FE, Duvoisin RC. "Apraxia" of eyelid opening: an involuntary levator inhibition. Neurology. 1985 Mar. 35(3):423-7. [Medline]. Schmidtke K, Büttner-Ennever JA. Nervous control of eyelid function. A review of clinical, experimental and pathological data. Brain. 1992 Feb. 115 Pt 1:227-47. [Medline]. De Renzi E, Gentilini M, Bazolli C. Eyelid movement disorders and motor impersistence in acute hemisphere disease. Neurology. 1986 Mar. 36(3):414-8. [Medline]. Smith D, Ishikawa T, Dhawan V, Winterkorn JS, Eidelberg D. Lid opening apraxia is associated with medial frontal hypometabolism. Mov Disord. 1995 May. 10(3):341-4. [Medline]. Suzuki Y, Kiyosawa M, Ohno N, Mochizuki M, Inaba A, Mizusawa H, et al. Glucose hypometabolism in medial frontal cortex of patients with apraxia of lid opening. Graefes Arch Clin Exp Ophthalmol. 2003 Jul. 241(7):529-34. [Medline]. Dimitriou J, Montoute T, Levivier M, Borruat FX, Diserens K. Bilateral ptosis: Lesion in the oculomotor nuclei or supranuclear lesion?. NeuroRehabilitation. 2015. 36 (3):323-7. [Medline]. Micheli F, Cersosimo G, Scorticati MC, Ledesma D, Molinos J. Blepharospasm and apraxia of eyelid opening in lithium intoxication. Clin Neuropharmacol. 1999 May-Jun. 22(3):176-9. [Medline]. Tsuji S, Kikkawa S, Horiguchi J, Yamashita H, Kagaya A, Morinobu S, et al. Meige syndrome with apraxia of lid opening after the discontinuation of sulpiride treatment. Pharmacopsychiatry. 2002 Jul. 35(4):155-6. [Medline]. Golbe LI, Davis PH, Lepore FE. Eyelid movement abnormalities in progressive supranuclear palsy. Mov Disord. 1989. 4(4):297-302. [Medline]. Brusa A, Meneghini S, Piccardo A, Stoehr R. Apraxia of lid opening. Ital J Neurol Sci. 1981 Dec. 2(4):367-70. [Medline]. Lee KC, Finley R, Miller B. Apraxia of lid opening: dose-dependent response to carbidopa-levodopa. Pharmacotherapy. 2004 Mar. 24(3):401-3. [Medline]. Roh JK, Kim BG, Kim DE, Ahn TB. Apraxia of lid opening associated with hydrocephalus. Eur Neurol. 2001. 45(1):53-4. [Medline]. Abe K, Fujimura H, Tatsumi C, Toyooka K, Yorifuji S, Yanagihara T. Eyelid "apraxia" in patients with motor neuron disease. J Neurol Neurosurg Psychiatry. 1995 Dec. 59(6):629-32. [Medline]. Bonaventura I, Matias-Guiu J, Cervera C, Codina Puiggros A. Neuroacanthocytosis syndrome, apraxia of eyelid opening, and progressive supranuclear palsy. Neurology. 1986 Sep. 36(9):1276. [Medline]. Friedman DI, Jankovic J, McCrary JA 3rd. Neuro-ophthalmic findings in progressive supranuclear palsy. J Clin Neuroophthalmol. 1992 Jun. 12(2):104-9. [Medline]. Keane JR. Lid-opening apraxia in Wilson's disease. J Clin Neuroophthalmol. 1988 Mar. 8(1):31-3. [Medline]. Tolosa E, Martí MJ. Blepharospasm-oromandibular dystonia syndrome (Meige's syndrome): clinical aspects. Adv Neurol. 1988. 49:73-84. [Medline]. Nakashima K, Kusumi M, Inoue Y, Takahashi K. Prevalence of focal dystonias in the western area of Tottori Prefecture in Japan. Mov Disord. 1995 Jul. 10(4):440-3. [Medline]. Nutt JG, Muenter MD, Melton LJ 3rd, Aronson A, Kurland LT. Epidemiology of dystonia in Rochester, Minnesota. Adv Neurol. 1988. 50:361-5. [Medline]. Duffey PO, Butler AG, Hawthorne MR, Barnes MP. The epidemiology of the primary dystonias in the north of England. Adv Neurol. 1998. 78:121-5. [Medline]. A prevalence study of primary dystonia in eight European countries. J Neurol. 2000 Oct. 247(10):787-92. [Medline]. Defazio G, Livrea P, Lamberti P, De Salvia R, Laddomada G, Giorelli M, et al. Isolated so-called apraxia of eyelid opening: report of 10 cases and a review of the literature. Eur Neurol. 1998. 39(4):204-10. [Medline]. Nutt JG. Lid abnormalities secondary to cerebral hemisphere lesions. Ann Neurol. 1977 Feb. 1(2):149-51. [Medline]. Lepore FE. So-called apraxias of lid movement. Adv Neurol. 1988. 49:85-90. [Medline]. Paus S, Zsurka G, Baron M, Deschauer M, Bamberg C, Klockgether T, et al. Apraxia of lid opening mimicking ptosis in compound heterozygosity for A467T and W748S POLG1 mutations. Mov Disord. 2008 Jul 15. 23(9):1286-8. [Medline]. Forget R, Tozlovanu V, Iancu A, Boghen D. Botulinum toxin improves lid opening delays in blepharospasm-associated apraxia of lid opening. Neurology. 2002 Jun 25. 58(12):1843-6. [Medline]. Jankovic J. Disease-oriented approach to botulinum toxin use. Toxicon. 2008 Dec 6. [Medline]. Yamada S, Matsuo K, Hirayama M, Sobue G. The effects of levodopa on apraxia of lid opening: A case report. Neurology. 2004 Mar 9. 62(5):830-1. [Medline]. Dewey RB Jr, Maraganore DM. Isolated eyelid-opening apraxia: report of a new levodopa-responsive syndrome. Neurology. 1994 Sep. 44(9):1752-4. [Medline]. Chand RP, Park DM. Atypical blepharospasm responsive to sodium valproate. Mov Disord. 1994 Jan. 9(1):116-7. [Medline]. Klostermann W, Vieregge P, Kompf D. Apraxia of eyelid opening after bilateral stereotaxic subthalamotomy. J Neuroophthalmol. 1997 Jun. 17(2):122-3. [Medline]. Ugarte M, Teimory M. Apraxia of lid opening. Br J Ophthalmol. 2007 Jul. 91(7):854. [Medline]. A man with apraxia of lid opening is unable to open his lids at will. Eye movements were full. Attempted eye opening resulted in frontalis muscle contraction, backward thrusting of the head, and pretarsal orbicularis oculi activity. Spontaneous reflex blinking was normal. The lids remained open following manual elevation.